In my last post, I talked about the patient filling gaps in healthcare. Dedicated to researching how we can help improve care for other people with diabetes, and how health care providers can be more empathetic and present with patients – what I see as critical to care for people who live with a chronic condition – I love reading books written by doctors that describe their world. 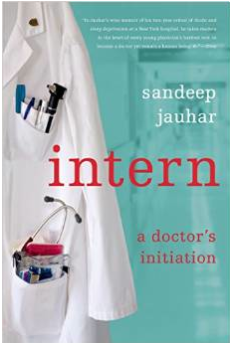 I’ve already shared I’m a big fan of physician/authors’ Danielle Ofri and Rachel Naomi Remen and I’m currently reading the book, “Intern” by Sandeep Jauhar. Jauhar describes his first year as a resident at a big city hospital. As he points out, efficiency and getting through rounds seeing patients is more important than any quality time spent with patients. It’s a stunning, shocking, eye-opening revelation how grueling medical training is, how little “care” is actually given patients and how the process all but completely trains empathy out of burgeoning doctors. As Jauhar writes as well, for all the work loaded on nurses’ shoulders without equivalent power, they are the force in a hospital who can make your life hell or tolerable. I find the book engrossing and it helps me to understand the fierce pressure, competition, opposing forces, desire not to show any weakness or ignorance and time constraints being a good, kind and caring medical professional costs in our healthcare system. It’s a sad and unfortunate revelation.